As the largest and most comprehensive 4-year apparel and textiles program that offers a full Apparel Design program and an in-depth Merchandising program in Washington, we offer students all of the tools necessary to succeed in the fashion, retail, textiles and apparel industries. We have state of the art classroom equipment, fully equipped apparel design studios, a program with curriculum aligned to the industry, and both nationally and internationally recognized faculty. Hear from students about the value of a degree in apparel, merchandising, design and textile. Cougar Couture showcasing student and faculty achievements. Learn about top level researchers using state-of-the-art technologies to solve current industry issues. 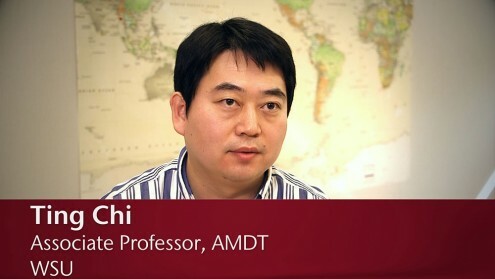 Where can a degree from AMDT take you? Tailor your major to fit your interests. Choose an emphasis in apparel design or merchandising, and individualize your expertise by exploring minors in business, marketing, entrepreneurship, communication or fine arts. Network and gain industry experience! Get involved in our student club or gain a competitive edge by doing an internship.